Here's a good news to all TM and Globe subscribers, you can still enjoy their zero cost Facebook access until Feruary 14, 2014 this year. As part of their Project Wonderful campaign and promotions, Globe Telecom extended their free FB browsing, send, post status, chat and other things that you can do on your Facebook until next month. No need for you to register on Globe unlisurf promo just for the purpose of accessing FB as you can do it without wasting a single coin on your pocket. To those who haven't tried this yet, check out Globe and TM Free Facebook. Using this promo is free, you don't even need a P1 maintaining balance like Smart usual practice. All you need is a smartphone or feature phone that is capable of connecting wireless GPRS, EDGE, 3G and 4G network. Making it work is also as simple as balance inquiry, all you have to do is *143# then select the FREE FB option then subscribe and that's it. 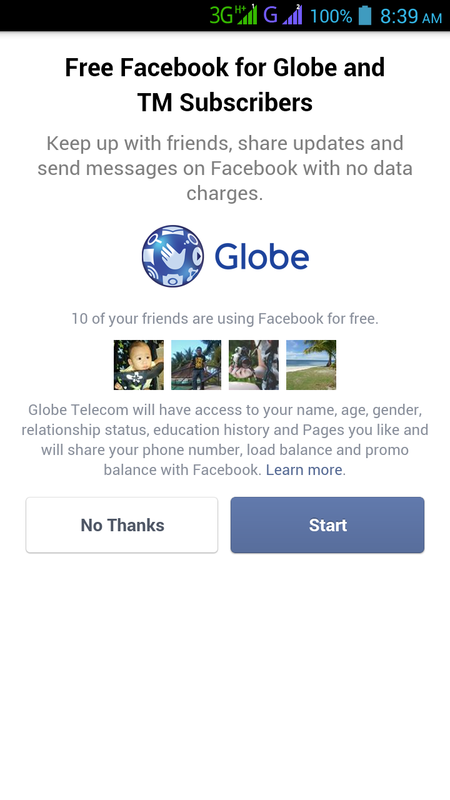 For those who had a hard time on making this Globe Free Facebook promo work, we'll give you a few tips on how to it and how to fully enjoy offer. 1. Know your phones connectivity settings, activate your mobile data and configure correctly your Globe GPRS / 3G settings. Use http.globe.com.ph APN for this to work on your phone. 2. Since it's free, don't use this if you have extra load above 5 pesos. This is to avoid unwanted charges like accidentally clicking outside Facebook domain links. Though it has a warning, it is better to be safe than sorry. 3. For slow connection or loading, make sure that your area has good signal. If 3G is available, try switching you connection to auto mode or fixed it to WCDMA for faster browsing. 4. If you are going to register to TM and Globe Unlisurf Promo, make sure to opt out the free Facebook promo to avoid slow loading internet connection problem on your phone. Globe and TM (Touch Mobile) free Facebook promo is extended until April 25, 2014. That's it for now guys, feel free to share your experiences, problem and comments while using the free service from Globe Telecom.